Producers may want to recondition soybeans that were harvested at lower moisture contents to bring the moisture content up to the market standard of 13 percent. On a 40-bushel-per-acre yield, harvesting soybeans at 9 percent moisture content, rather than 13 percent, is equal to 1.8 bushels of lost weight per acre. At $9 per bushel, that is $16.20 per acre. Just as grain is dried with bin fans, soybeans can be reconditioned by operating fans during periods with the desired air temperature and relative humidity. Reconditioning requires high airflow rates for several weeks using air with an average relative humidity of about 70 percent to recondition soybeans to 13 percent during normal fall temperatures of 30 to 60 F. Be aware that the air will be heated 3 to 5 degrees as it goes through the fan, which reduces the air relative humidity slightly. A reconditioning zone develops and moves slowly through the bin in the direction of the airflow, which is similar to a drying zone in natural-air drying. Reconditioning occurs the fastest when the airflow rate, cubic feet of airflow per minute per bushel (cfm/bu), is high and the air is warm and humid. It will be the most successful in a drying bin with a fully perforated floor and a fan that can deliver at least 0.75 cfm/bu. Even with this airflow, moving a reconditioning front all the way through the bin would probably take at least a month of fan operation. Producers need to compare the cost of fan operation with the benefit of marketing at the desired moisture content. To estimate the cost of operating the fan, assume a 1 horsepower fan motor will use 1 kilowatt (kW) of electricity for each hour of operation. For example, if reconditioning the soybeans takes 30 days of fan operation, that is 720 hours. Achieving an airflow rate of 0.75 cfm/bu on a 42-foot-diameter bin filled 20 feet deep with soybeans would require a 15 horsepower fan. The cost to operate the fan, assuming an electricity cost of 10 cents per kilowatt-hour, is $1,080. Increasing the moisture content from 9 to 13 percent would increase the quantity of soybeans by 1,019 bushels. At a price of $9 per bushel, this is worth $9,171, which is more than the cost of operating the fan in this example. You would need only a 3 hp fan to provide an airflow rate of about 0.25 cfm/bu., but reconditioning the beans would take about 90 days. If the fan is operated just in periods of very high humidity, such as during fog or when the relative humidity is near 100 percent, the soybeans in part of the bin would be too wet to be stored safely. Mixing the wet layers with dry layers would reduce the spoilage risk and discounts for marketing wet beans. However, stirring increases the bean damage. Emptying the bin and moving the beans through a grain-handling system will provide only limited mixing because the majority of the grain comes from the top of the bin in a funnel shape with a center unloading sump. A humidistat can operate the fan when the relative humidity will average about 70 percent. Even though the humidity level varies considerably during the day, it will average about 70 percent if the fan is operated for a time when the humidity is 90 percent and for a time when it is 50 percent. Setting the humidistat to operate the fan when the humidity exceeds about 55 percent would be a reasonable starting point. 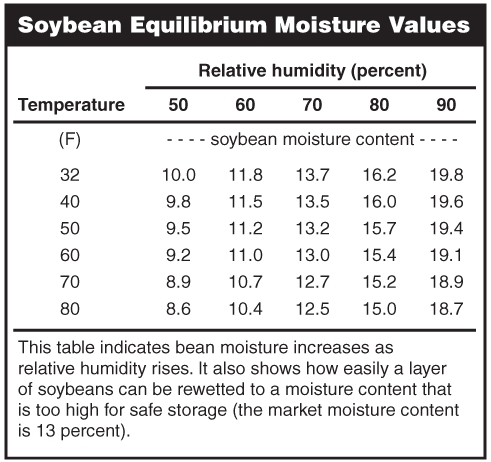 However, the humidity setting would need to be adjusted based on a measured soybean moisture content. To avoid wetting the beans to moisture levels unsafe for storage, add a second humidistat to stop the fan when the relative humidity reaches very high levels or use a microprocessor-based fan controller that monitors temperature and humidity, and runs the fan only when air conditions will bring the crop to the desired moisture content. A disadvantage of these options is that the fan does not run as many hours. Controlling the fan manually and operating it during the night and a portion of the day, based on the measured humidity, is another option, but fan and moisture control is not as accurate with this method. Soybeans expand when they absorb moisture, so a moisture content increase of more than a point or two could create enough pressure to damage the grain bin’s bolted connections or even cause the bin to rupture. The bin warranty may be voided if damage occurs while reconditioning grain. One way to reduce the pressure is to unload some beans from the bin periodically. Another way to reduce the damage potential is to use a negative pressure system to pull humid air down through the soybeans and remove the soybeans from the top of the bin as they are reconditioned. An additional way to reduce the pressure is to use a vertical-stirring auger to mix the beans periodically. Unfortunately, these methods of reducing pressure have not been well researched and are based on field experience primarily with smaller bins.